Did I scare you? I hope not too badly – if you're a Munchkin fan, our love for Halloween ghost without saying. We've got some fun news witch I will reveal now. We announced Munchkin Clowns for February 2018. This 15-card mini-expansion comes in a blister pack and was illustrated by Len Peralta. It's more fun than a pie in the face! 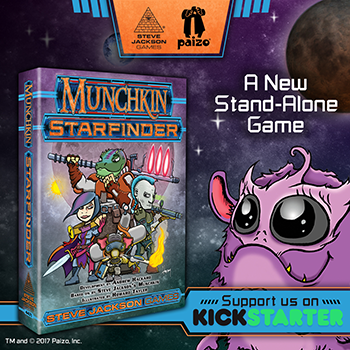 The Munchkin Collectible Card Game is at print and on track to come out in February as well. You can get one of the three different two-player starters, each with two classes to play head-to-head right out of the box. Or get all three starters and complete the set of six classes! We'll also have 12-card randomized booster packs for customizing and honing your constructed decks or for draft play at your Friendly Local Game Store. You can even preorder with your store with our preorder forms! The first expansion, The Desolation of Blarg, is in production now, and we're working hard on the second expansion, Fashion Furious. We'll have one more expansion late next year – watch for more information about that one coming early in 2018. I certainly don't want to forget the Kickstarter for Munchkin Starfinder – the more we fund, the more Starfinder you get! 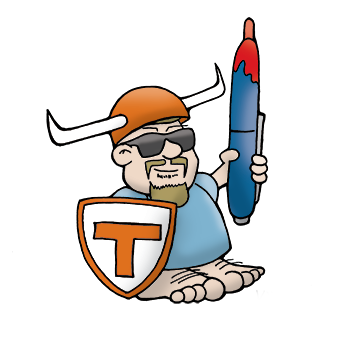 We're thrilled to work with Paizo again after the fun we've had on Munchkin Pathfinder, and getting Howard Tayler as the artist is an extra bonus! Check out the Kickstarter for early peeks at some of Howard's work on the Starfinder cards, and watch this space for more news once the Kickstarter gets underway. Speaking of Kickstarter, thanks to everyone who backed the recent Munchkin Holiday Grab Boxes. If you missed out, keep an eye on Warehouse 23; we'll be putting a few extras up for sale very soon. If you haven't been reading Munchkin News, you missed my discussion of the proper way to celebrate Munchkin Halloween. Go back and look at the October 2 post. We still have a few more secrets to reveal before 2017 is over, so come back in November to get more news from the world of Munchkin. See you then!